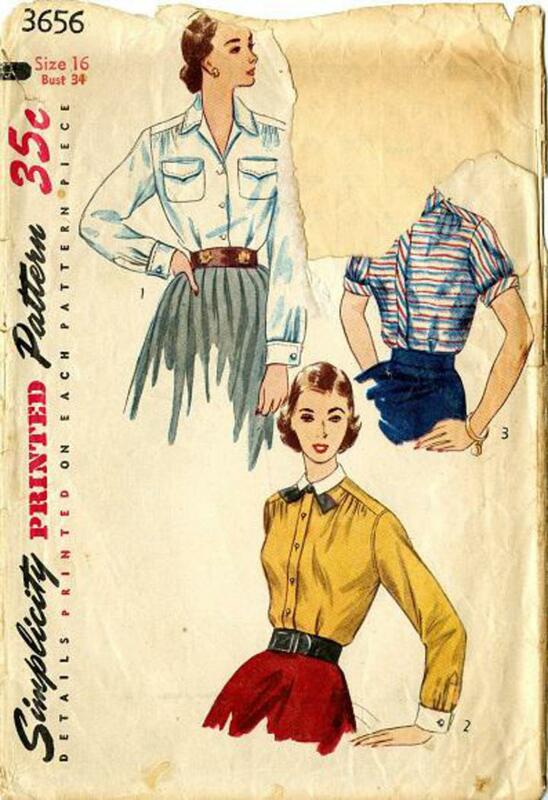 1941 Simplicity #3656 vintage sewing pattern, misses' blouse styled with a yoke. Style 1 and 2 have long sleeves with french cuffs. Shirtwaist blouse, style 1, has patch pockets with turn down flaps and saddle stitching trim. Style 2 is man tailored with a four button closing, contrasting collar and cuffs, and a bow at the neck edge. Style 3 has a fly front, Peter Pan collar and short sleeves. Envelope is in poor condition, pattern in good condition.